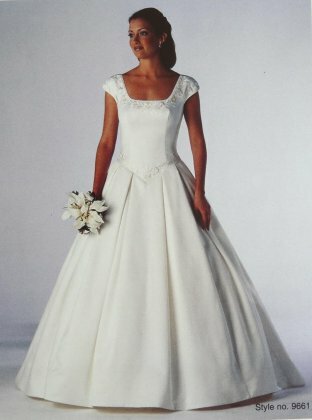 A traditional style ivory wedding dress with simple lines in matt satin. The dress is full skirted with boxe pleats and a train.. It has a squared neckline with cap sleeves. 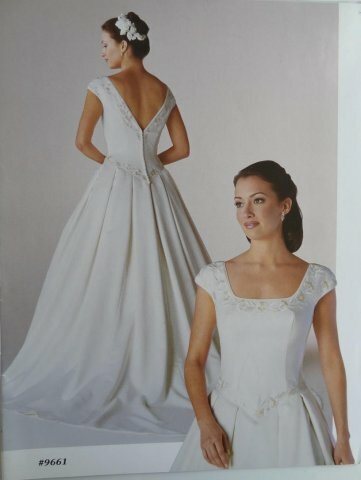 The decoration is ivory emboidery around the neckline and waist. The dress has layers of net built in to the dress but keeps a better shape if you wear an additional hooped underskirt.